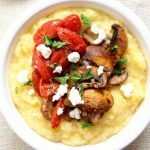 Instant Pot Creamy Polenta with Roasted Tomatoes–easiest to make polenta ever, thanks to your electric pressure cooker! 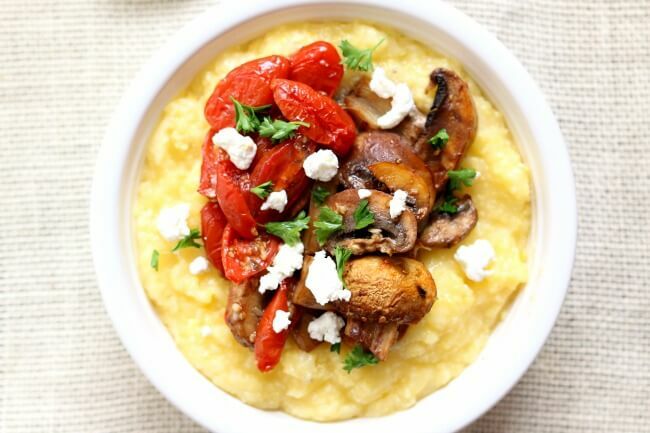 Creamy polenta is served hot with balsamic drizzled roasted tomatoes, mushrooms and garlic and then topped with tart goat cheese. A perfect meatless meal that will leave you feeling satisfied. If you like creamy dreamy polenta without a lot of fuss then this recipe is for you. The Instant Pot allows you to make polenta without stirring or messing with the temperature on the stove. It can also keep your polenta warm until everyone is home to eat it. Which is a bonus these busy days of May. While the polenta was cooking in the Instant Pot I decided to roast mushrooms, tomatoes and garlic in a little bit of oil and balsamic vinegar. The vegetables and the polenta almost get done at the exact same time. I topped my polenta with a little bit of goat cheese for a bit of tartness and flavor. I couldn’t get enough of the tomatoes. They paired perfectly with the polenta. I want to make this again today for lunch! YUM! To make Instant Pot Creamy Polenta with Roasted Tomatoes I used my 6 quart Instant Pot Duo 60 7 in 1*. I love this Instant Pot because it has the yogurt making function which I use almost weekly. It has two pressure settings (high and low), and there are also little slots in the handles so that you can rest the lid there instead of putting it down on your counter-top. Easiest to make polenta ever, thanks to your electric pressure cooker! 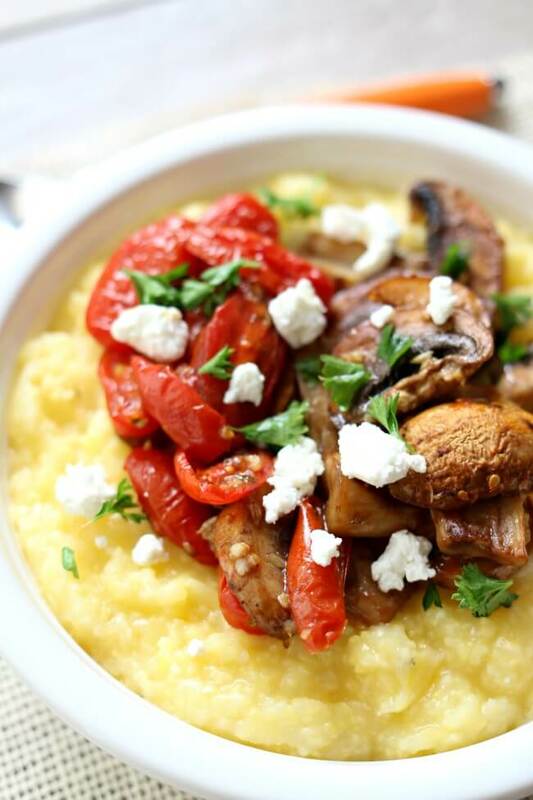 Creamy polenta is served hot with balsamic drizzled roasted tomatoes, mushrooms and garlic and then topped with tart goat cheese. A perfect meatless meal that will leave you feeling satisfied. Add water, polenta and salt to your Instant Pot. Whisk. Cover the pot and make sure valve is set to sealing. Set the porridge button to 20 minutes (if you don’t have a porridge button you can use the manual/pressure cook button for 20 minutes on high pressure). Turn your oven to 400° F. While the polenta is cooking slice your vegetables. 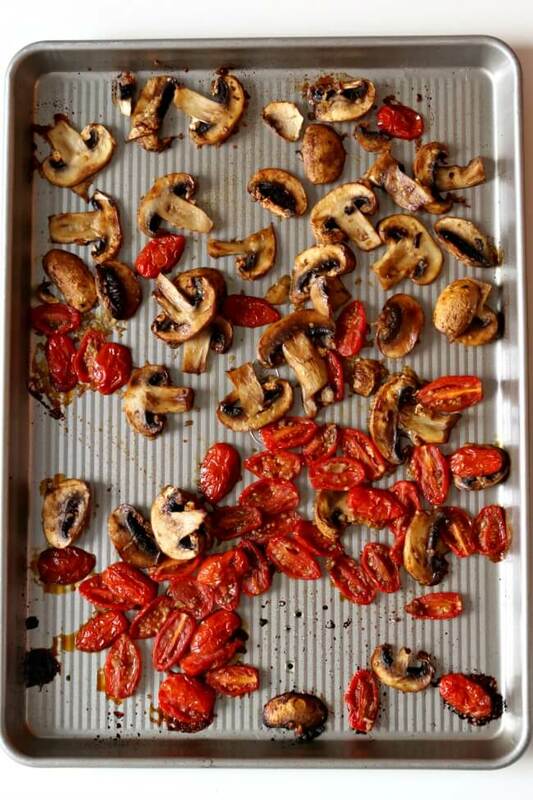 Add mushrooms, tomatoes, oil, balsamic vinegar and garlic to a large bowl. Toss to coat vegetables in the oil. Spread out the contents of bowl onto a sheet pan. Lightly salt and pepper. Cook in the oven for 15-20 minutes. Once the Instant Pot timer beeps, let the pressure release naturally for 10 minutes and then move the valve to venting to remove any remaining pressure. Carefully open the lid. Whisk the polenta until creamy. Scoop into bowls and top with roasted veggies and top with 1 tablespoon of goat cheese. 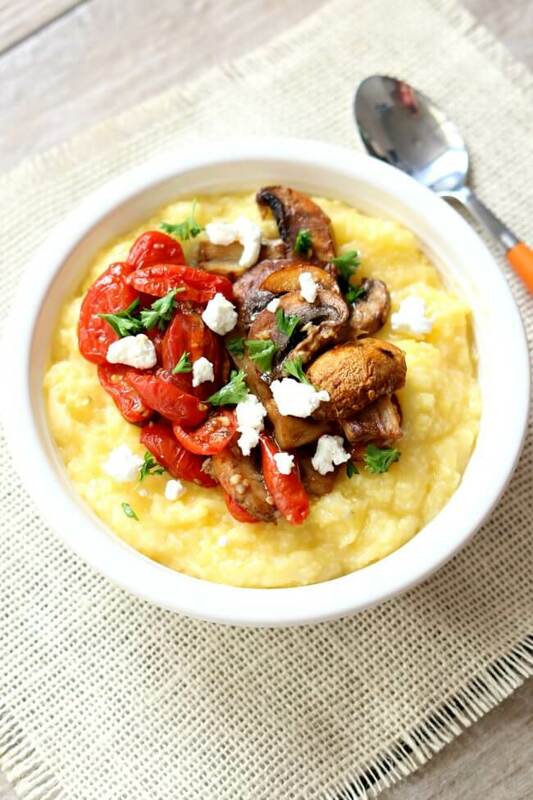 Like this recipe for Instant Pot Creamy Polenta with Roasted Tomatoes? Get all my new recipes delivered to your email inbox by signing up below. This was very good. Followed the recipe to a T (which is unusual for me), and was happy with the results. Makes a good side dish. I’m glad you liked it. I love this one myself. I would like to make cream of wheat in my instant Pot. I have the Quaker brand that takes 10 minutes to make, so as you can see it is not the instant brand. How would I make this in my Instant Pot? Would I use the same amount of water to cream of wheat ratio as you use for your Polenta?? Should my cooking time be the same too??? Any suggestions would be greatly appreciative. I looked online and couldn’t see the quaker product you are talking about. Are you talking about grits? Send me a link to the product. Using the manual button, what temp? Hi or low pressure? I’m new details help. Thanks. high pressure and 20 minutes! I would like to know if you have a recipe for Greek pasta, topped with feta cheese. (IP) PLEASE. I had it this past week, at a restaurant, and it was soo good. Looking forward to the recipe. That sounds really yummy! What restaurant was it?